One of the world’s leading young environmental researchers has chosen to continue her ground-breaking work at the Australian Maritime College. 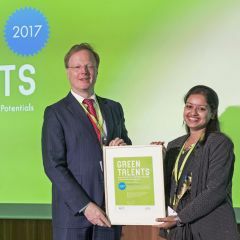 Pratiksha Srivastava, who was working at the Institute of Minerals and Materials Technology, Bhubaneswar, India, is one of 25 winners of the International Green Talent Awards. 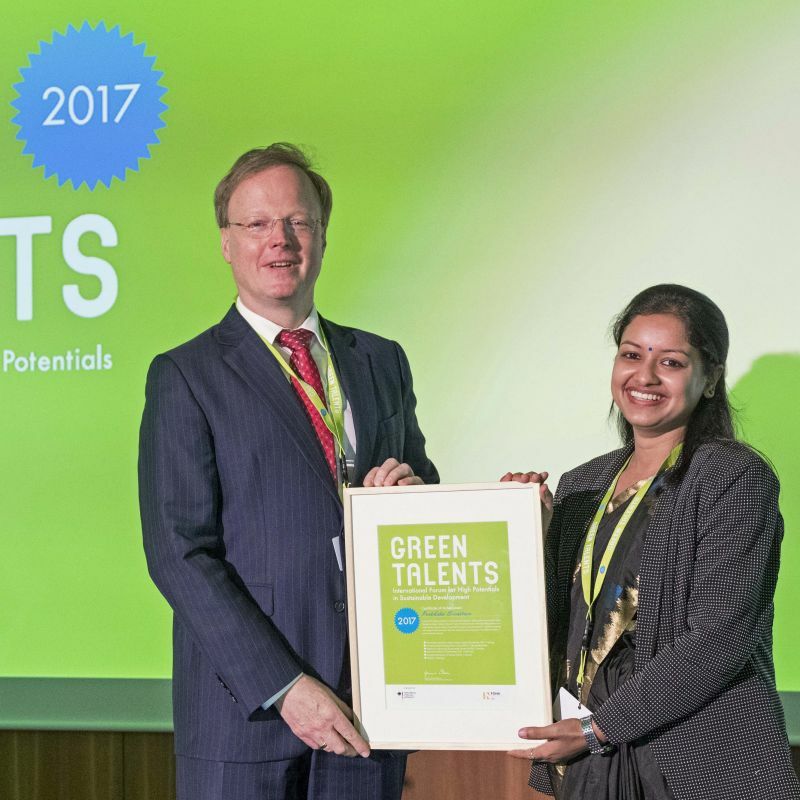 Conferred under the patronage of the German Research Minister, Professor Johanna Wanka, the awards provide young researchers with a platform for sharing their views on green concepts to improve environmental sustainability. A high-ranking jury of experts selected 25 up and coming scientists out of 602 applicants from over 95 countries. Their prize is one of the coveted tickets to go to the Green Talents – International Forum for High Potentials in Sustainable Development. Raised in a small village in India, Ms Srivastava has drawn on her personal experiences to direct her career into wastewater treatment and sanitation technologies with the aim of improving the lives of villagers in her home country. “Coming from a small village, I was aware of the villagers’ situation. Most of the time they and their cattle share the same water resources for drinking, bathing and other tasks,” she said. Ms Srivastava identified a number of constraints to improving the quality of life in Indian villages including the lack of technical know-how, very poor infrastructure, a shortage of electricity and poverty. She recognised the implementation of a low cost solution for wastewater treatment and sanitation was likely to be one of the best options to improve the situation. Ms Srivastava focussed on constructed wetlands, which is a low cost and simple technology, appropriate for Indian conditions. A series of shallow, densely-planted man-made ponds, constructed wetlands help filter water through physical and biological processes. They can run on solar energy without the need for any chemical and mechanical equipment, have almost no operation and maintenance costs and can be built with local resources. But while constructed wetland technology has several advantages, it has a slow wastewater treatment rate and a high land-use footprint. So to improve the performance and speed of treatment in constructed wetlands, Ms Srivastava and her supervisor successfully developed a novel technology named Integrated Constructed Wetlands Microbial Fuel Cell (CW –MFC). Using this approach, the performance efficiency of the constructed wetlands almost doubled. The CW-MFC has a reduced land-use footprint and in something of a world-first, can generate electricity. The new technology is gaining much interest at a global level from key constructed wetlands scientists. Ms Srivastava and her research group also designed and built a unique zero-discharge water recyclable community toilet which is working in Bhubaneswar. It is integrated with constructed wetlands and innovative septic tanks. Her research deals with biotechnology, microbiology, process engineering, electrochemistry, inorganic chemistry, botany and environmental science and engineering. Ms Srivastava is now in the early phases of her PhD at AMC, where she is focussing on the development of marine microbial fuel cells for various environmental applications. “Terrestrial resource based microbial fuel cell technology have limited applications, while marine resources are vast and have enormous potential. I wish to use this technology for marine applications and want to develop next generation microbial fuel cells for various applications using marine resources like marine bacteria or marine sludge,” she said. While it’s a long way from her home in India, Ms Srivastava is excited by the opportunity to study at AMC, after hearing about the institution through a colleague and then researching it on the internet. Ms Srivastava’s PhD is supervised by Drs Vikram Garaniya and Rouzbeh Abbassi from AMC, and Dr Trevor Lewis from the School of Physical Sciences. “My supervisors have vast experience and are very supportive. In fact, I cannot progress much further in the work without the significant support of AMC lecturers and staff,” she said. Dr Garaniya is proud the AMC has attracted such a highly talented scholar and grateful for funding support through the Tasmanian Community Fund to enable Ms Srivastava to take up the PhD opportunity. For Ms Srivastava, studying a PhD at AMC provides the chance to bridge a gap in her research and collaborate with experts, but perhaps more importantly, allows her to develop technologies that will significantly improve the lives of people around the world.